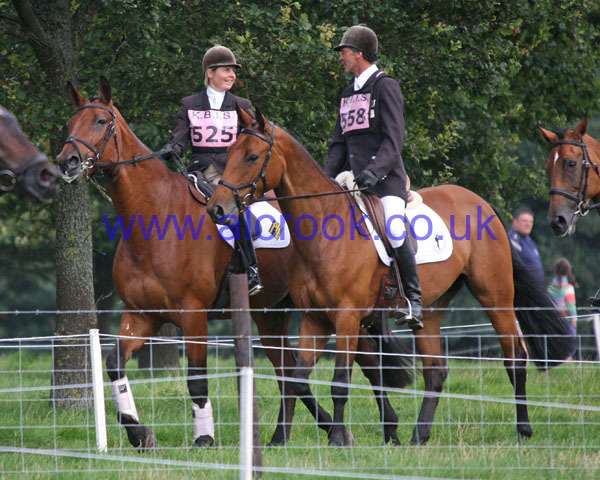 Andrew Nicholson took two 2nd & a 4th places at the Highclere Castle One Day Event on Sunday. Things didn't all go his way however as he had a fall at the roll top following the Steps-up, then had a dodgy moment at the same fence on SIRIO later in the day. It was good to see Lucy Jakson back in action with 3rd & 4th places in the Open Intermediate, she's made a remarkably quick recovery from breaking her ankle in the week before the Olympic Test Event at Greenwich Park. Tim Rogers had a broken stirrup, he noticed it was broken coming out of the water, but bravely decided to carry on up the steps, & then having gone down the drop decided to retire. One of the event's Directors Jonathan Benney was being kept busy trying to find alternative parking for spectators & sponsors as heavy rain had turned much of it into mud during Saturday's BE100 classes. One of the fences had to be taken out & they didn't finish on the cross country until 6:45pm. Sunday's running was mostly busy Intermediate sections with a lot of riders with multiple horses. A brief if heavy shower late morning didn't help the already saturated ground. During the afternoon there were a couple of more prolonged cloudbursts which saw the ground start to cut up, this really caused more problems in the show jumping than on the cross country. The fence judges were being urged to radio in any changes in the ground conditions around their fences. Despite much of the course being in a natural bowl the going remained remarkably good with the downhill section to the water being of particular concern. With the various delays the decision was made to abandon the BE100+ show jumping & cross country, & complete the remaining Intermediate sections. At around 6pm & with the tractors working hard to remove horseboxes from lorry park the decison was taken to cancel Monday's sections.